In Posting setup (Tools-->setup-->Posting-->Posting) Dynamics GP have two posting option for each series. When transaction are posted in subsidiary modules, the information should also update General Ledger accounts. How and when this information flow to General Ledger is defined in Posting setup window. When Post To General Ledger is selected and Post Through General Ledger is not select and any transaction is posted from Subsidiary module it will create the Journal Entry in General Ledger. Transaction can be edited using General Ledger’s Transaction Entry window before posting permanent to General Ledger. When transaction posted from subsidiary module , instead of creating Journal Entry into General Ledger system will automatically update the General Ledger A/c. User can ‘t verify / Edit the GL Transaction using General Ledger Transaction Entry window as already GL A/c is updated. Its depend upon the organization which Posting Option they need. Hint : When entering Beginning Balance in Subsidiary Modules, the "PostTo General Ledger" option can be cleared. Make sure to reselect option before starting entering your regular transactions. 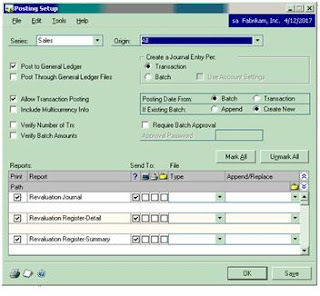 Hint : Another option is available when entering beginning balances to leave “Post to General Ledger” selected, do not select “Post through General Ledger” option and Delete the Batches created in General Ledger that contain the Beginning Balances.